Please enter your license code to receive updates: the license code required to receive updates. 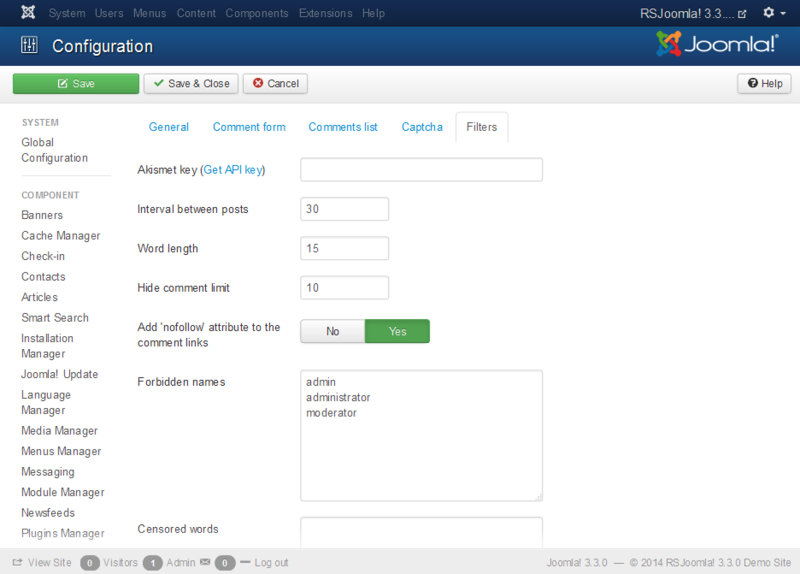 This is available in the rsjoomla.com > My Downloads area, after you have registered a domain. Date and Time Format: A mask used to display the date. This is based on the PHP date masks. Enable RSS: Enabling this option will display the RSS icon. 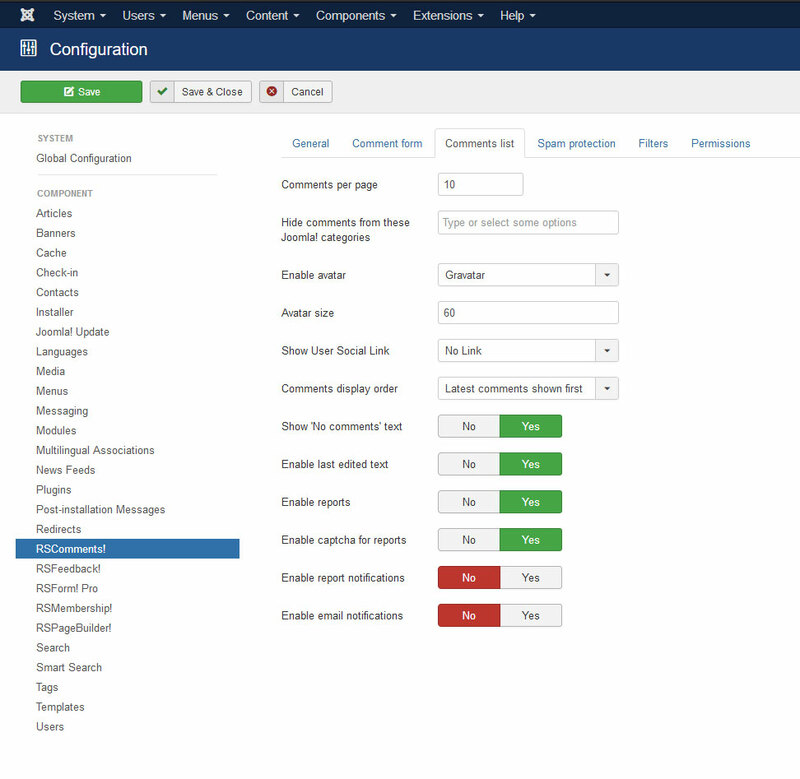 Default Modal: choose either Joomla! Bootstrap v2 modal or Magnific Popup when opening frontend modal links. 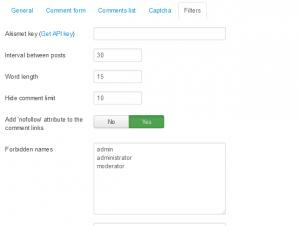 Show form labels: If enabled the form fields labels will be shown. Enable location: This will allow users to share their location (if enabled, a new field will appear - Google Maps API Key). 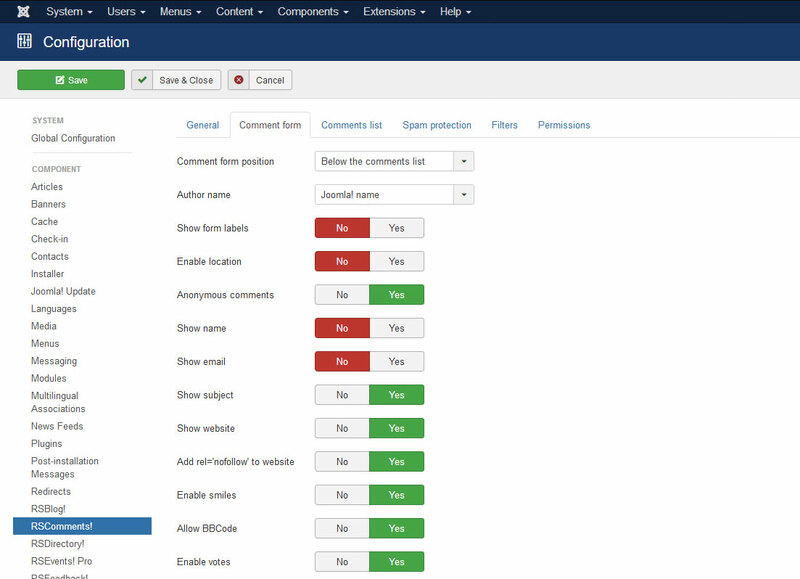 Enable accordion effect: Yes / No - the commenting form can be toggled. The comment form will be : Closed / Opened. 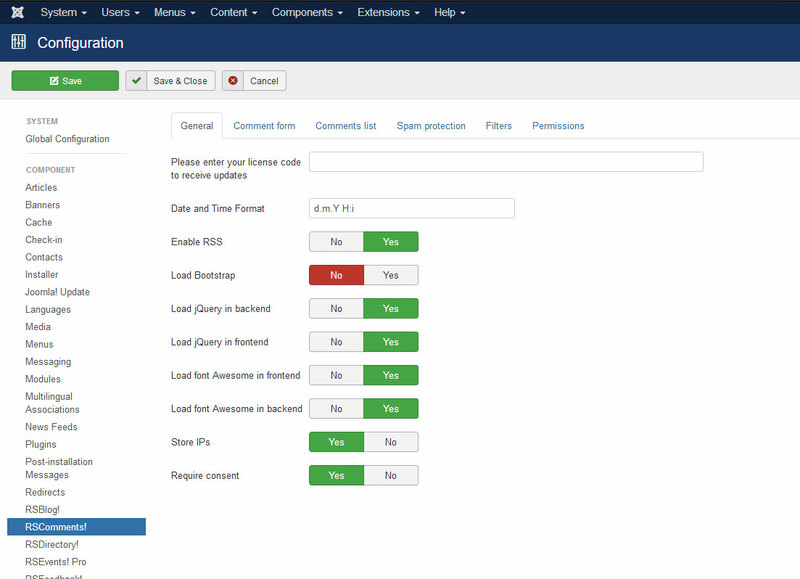 If the accordion effect is used, this option will set the current state of the form. Show User Social Link: no link, Community Builder, JomSocial. 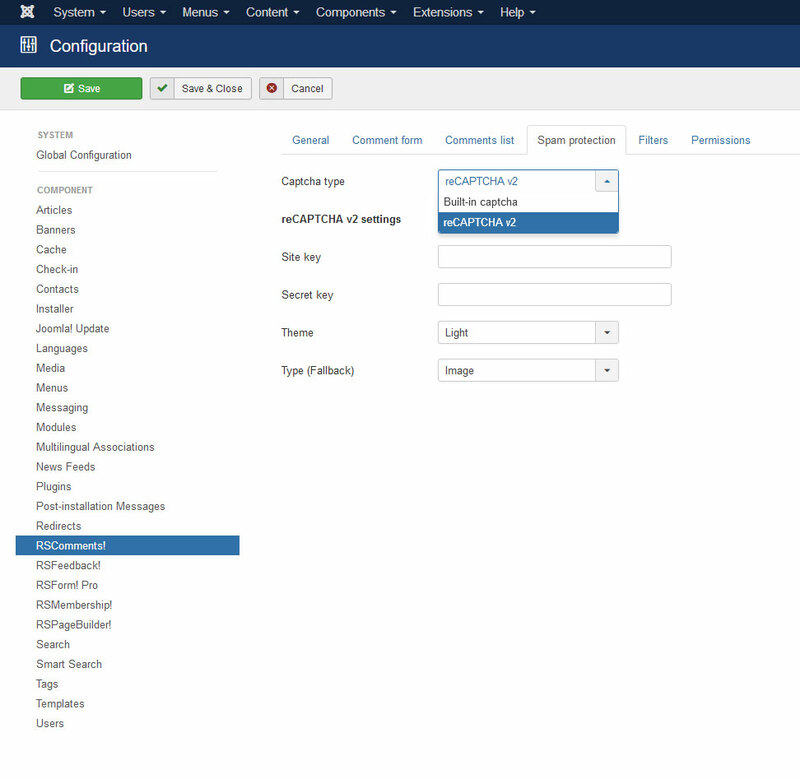 The avatar can be linked to the listed profiles, depending on the installed components. Case sensitive: the validation of the generated chars will be case sensitive. 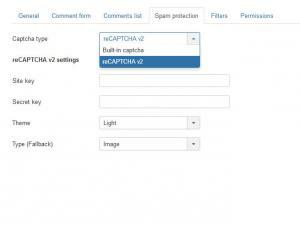 For example, if the captcha generates "AB" the system will only validate "AB" not "ab"
Akismet key: to use the Akismet comment validation you will require a key. 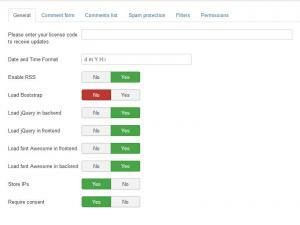 Using the Akismet option will provide some protection against spammers. Interval between posts: what time should pass before a new comment can be added by you. Word length: the maximum number of chars a word can have. This is useful for preventing the comment to break the layout. 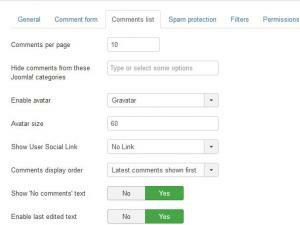 Add 'nofollow' attribute to the comment links: you can set this attribute to notify the search engines not to pass PageRank to the linked page. Forbidden names: the listed names can't be used when filling up the comment form(each on a new line). Block users: listed users are not able to comment(each on a new line). 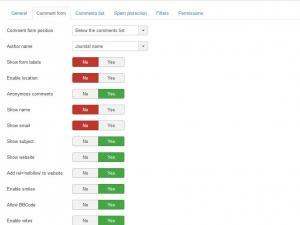 Block IP's: listed IP's are not able to comment(each on a new line).